My sons received their first toolbox and some of the Lowe’s building kits. 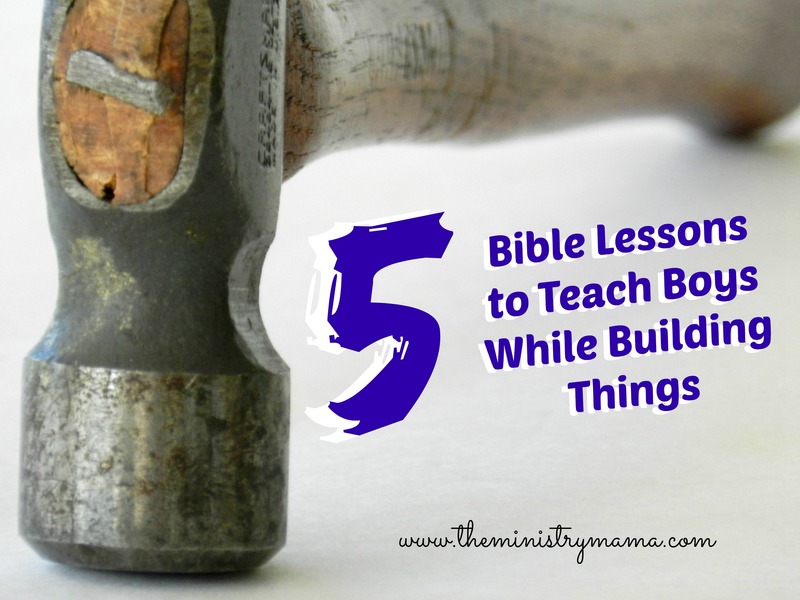 While we were working several days in a row on putting all of them together, I began to think of Bible lessons that could be taught to boys while you work beside them building things. Even as a mom, you can teach your sons manly Biblical principles while they are learning to avoid hitting their fingers while driving their first nails. All you have to do is read through these simple little lessons and then when you are working on your project, talk about them. You don’t have to read word-for-word any of this script, it is just here to help you have a starting place to be able to teach your children while you work beside each other on a project. God’s Word is like a hammer. God’s Word breaks the rock in pieces! The hard rock of our hearts can be broken by God’s Word. Just as a hammer is an important tool to have in your toolbox, the most important tool in your life is the Word of God. Learning God’s Word and obeying it will help your heart not to be hard. There are times in our life when we do not want to give up the sin in our lives, and when we learn and hear what the Bible says about that sin, God takes the hammer and strikes us right in the heart. When God speaks to you about something it is just like a hammer when it strikes a nail, in your heart, you know exactly what God is speaking to you about. It will be best, when God speaks, to do what God wants you to do and give up what God wants you to give up. Optional Idea: Take some time to try to break a rock into pieces with a hammer. Is it difficult? Does it take a lot of strength? Guide the nail, just like God guides His children. When you start to hammer a nail into a board, you have to hold the nail in the exact place where you want it to go. You hold it still between your finger and thumb and raise the hammer, and tap, tap, tap, you hit it a few times to get it in the right spot. Then, as it sinks into the wood, you can let go of the nail and finish driving it in with the hammer. We are never alone, once we are saved, God promises to guide us in our lives until we die. Psalm 48: 14 For this God is our God for ever and ever: he will be our guide even unto death. Your words are as powerful as power tools. Power tools are awesome! They are like a manly steak dinner, they are so awesome! Power tools have some special “powers” that help us do our work faster as well as better. The feeling of holding a power tool and pulling the button to make it work, makes you feel strong and capable of doing any type of construction job. Power tools must be used properly or they can be very dangerous. If you were to be irresponsible with a power tool then you could hurt yourself very easily. Just as power tools have strength, our words are just as powerful! The things we say can fly out of our mouth and hurt someone very quickly. We may also use our words and help and encourage someone when they are having a difficult time, and it may make all the difference in the world to that person. Our words can be like a deadly poison if we use them in a wrong way. And our words can bring life to a person’s life if we use them in a right way. Death could be the result if we disregard the warnings signs when we become angry, rude or disrespectful. Follow God’s plans for your life. Almost everything you build will require plans or instructions that will teach you step by step how to make the object that you are building. We follow those plans so that we do not build the object incorrectly. The plans are very important or you might lose time if you have to take things apart and start again. It might cost you materials if you do things in the wrong order and ruin your pieces. God has plans for our lives. In Genesis, God gave Noah plans on how to build the ark. In Exodus, God gave Moses plans on how He wanted the tabernacle built, as well as all the furniture that was to go inside it. These plans were very detailed, specifically drawn out and described, so that the builders could follow them and build it exactly the way God had described. God did not leave Noah or Moses with a huge task to complete, without a way to do it. He gave them plans and instructions. God does not leave us with a life to live with no plans for our life. The Bible is our instruction manual, the plans for our life. When we read it we learn how to put the pieces of a godly life together. It is very important to always read your Bible and learn what God wants for you to do. God will speak to you through your personal time with the Lord as well as when you listen to Bible teaching and preaching. In Genesis we can learn that God instructed Noah to begin building the ark because the flood would come to destroy the entire earth. God tells him ahead of time that he and his sons and their wives would be rescued with the earth’s animals inside the ark. Noah went to work constructing the massive boat of gopher wood, and followed God’s instructions to seal it with pitch on the inside. Then, the day came when all the animals were inside, and Noah walked into the ark with his wife and family and God shut the door. On that day the rain began to fall for the first time. In this verse we learn that God warned Noah about things he had never seen before. He showed his faith, that even we he did not understand or even know what a flood or rain was, that he still moved with fear and prepared the ark. Are you the type of person when you do not know the answer, you still have faith to trust God and do what He asks you to do? We all have Noah, the great builder of the ark, to look up to, when we are scared to obey. His faith is encouraging! Reading these simple little lessons can give you talking points in which you can help grow your child’s faith as you sharpen your axes as you work together. Please remember that you have to teach these lessons with a right heart yourself, and a gentle and kind manner, so that they will cling to your child’s heart and memory.